Come join us at Celebrate Recovery on Sundays at 4 pm in the Family Life Center at Bellview Baptist Church. Share your burdens, bad habits, hang-ups, and joys on the road to recovery. 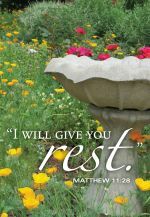 "Come to me, all of you who are weary and burdened, and I will give you rest" (Matthew 11:28). Copyright 2019 Bellview Baptist Church. All rights reserved.